Earlier this week, I told you about the squirrel attacks our front porch has been under for the past month. 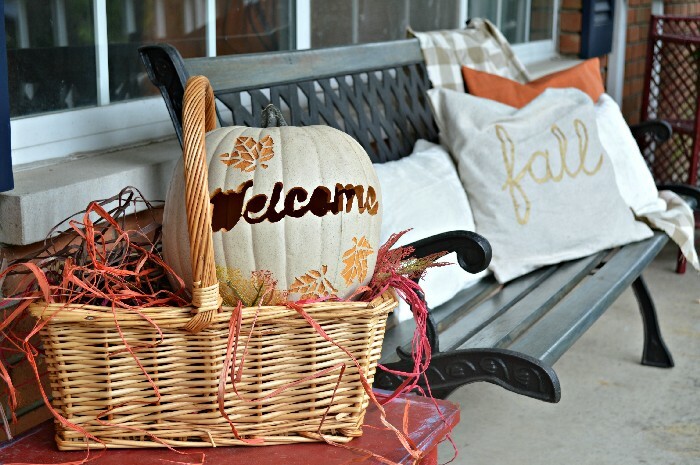 When I switched out our summer porch decor for fall pieces, I challenged myself to decorate only with items that couldn’t be destroyed by a squirrel with a grudge. 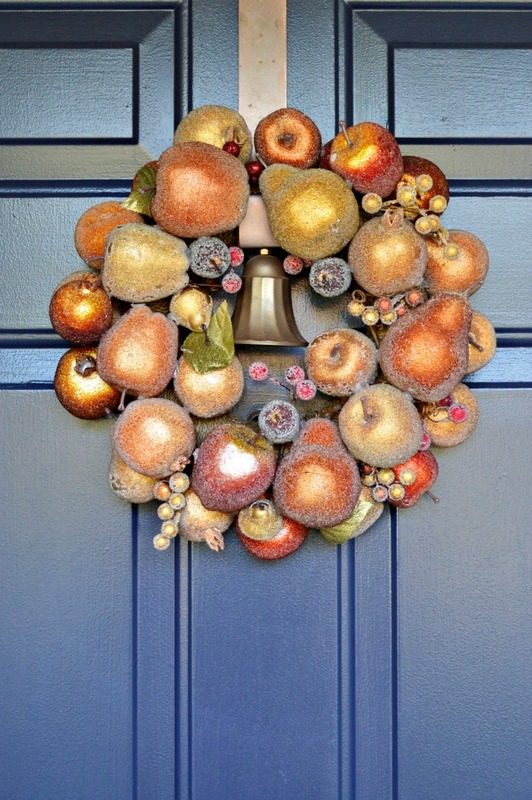 The challenge really limited my decor options: no real pumpkins, no mums, no acorns, no dried corn…. You get the picture. 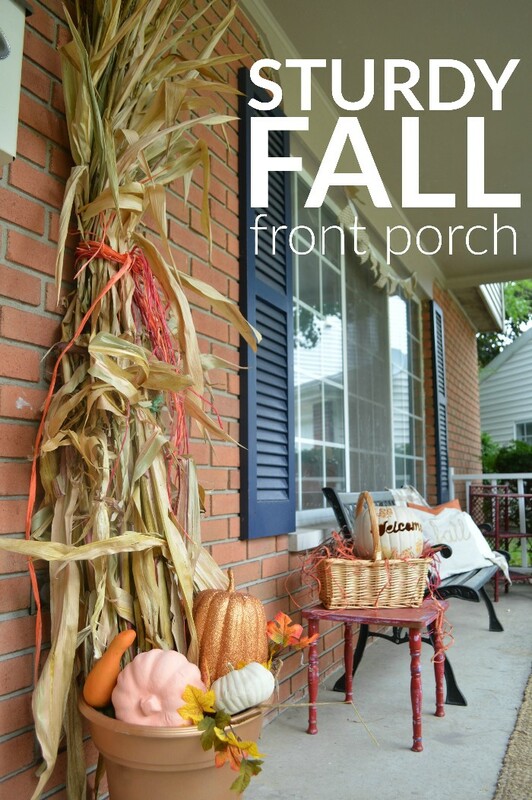 Take a look at what I came up with as I created a sturdy fall front porch. 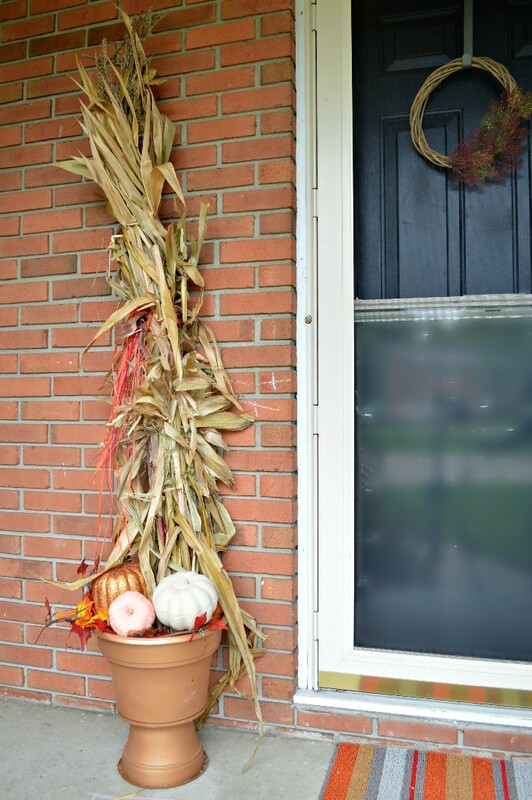 Instead of filling my Faux Bronze Pedestal Planters with mums, which the squirrel would probably knock over anyway, I decided to fill them with other fall decor. 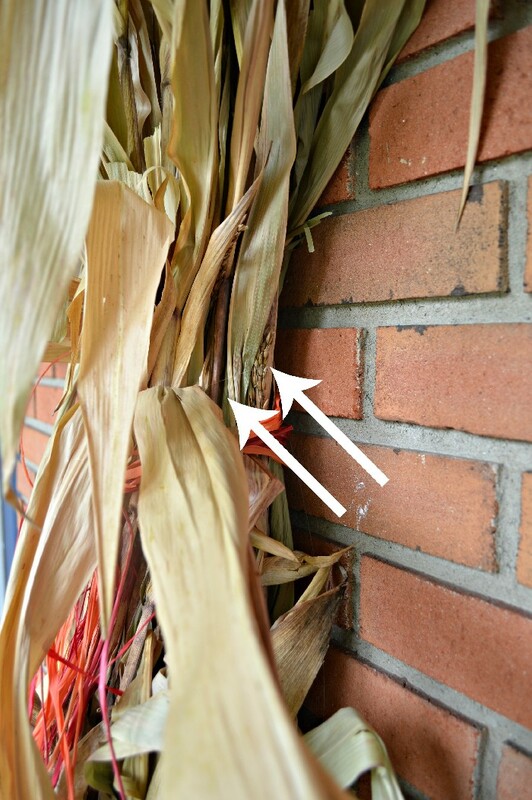 I bought a pair of corn stalks from a friend’s farm and positioned one in each planter. I filled the rest of the room of the planter with a dollar store leaf garland and a few foam pumpkins. I found the glitter pumpkins in the dollar spot at Target a few years ago. The other pumpkins are foam pumpkins I have repainted a couple of times. 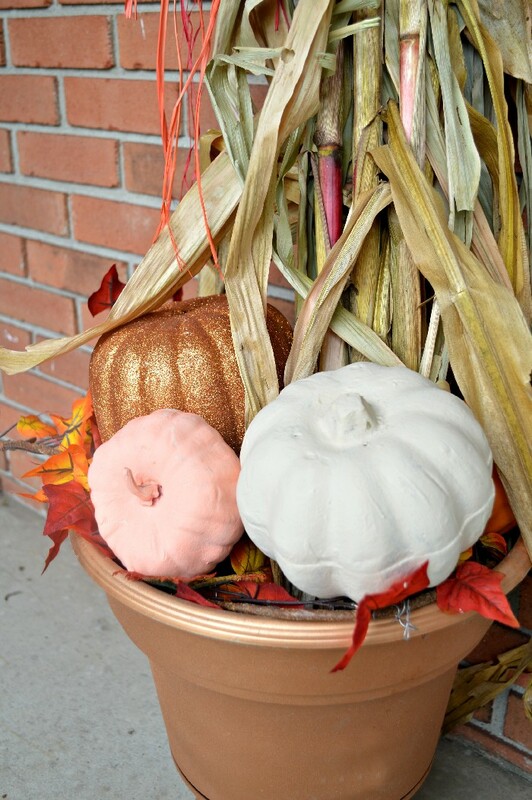 This year I used the same chalk paint colors that I did for my Faux Clay Pumpkins. What you can’t see unless you are really looking, is that the stalks are secured with monofilament. The first day I had the stalks on the porch, I came home to see that the squirrel had knocked them BOTH over. This squirrel, you guys. I already had some nails hammered into the porch’s wood trim from hanging the wood stars that were on our porch this summer. I wrapped the stalks with monofilament and tied them securely to the nails. The monofilament is hidden with some dollar store raffia. So far it has kept the stalks safe from squirrel attacks. 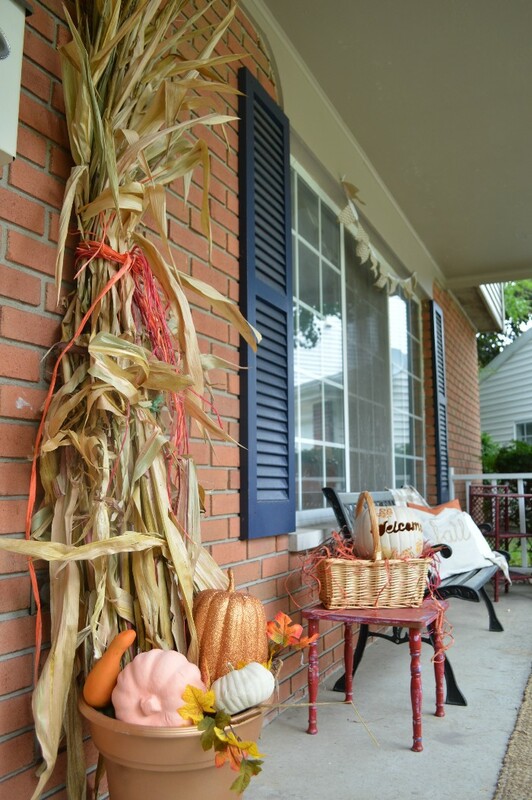 Looking down the porch, you can see a basket filled with dollar store raffia and my Dremel Etched Funkin. My new Faux Velvet Pillows are hanging out on the Blue Stained Bench along with a few other slipcovered throw pillows. None of these things are precious or expensive, so I am fine with leaving them outside and vulnerable to critters. 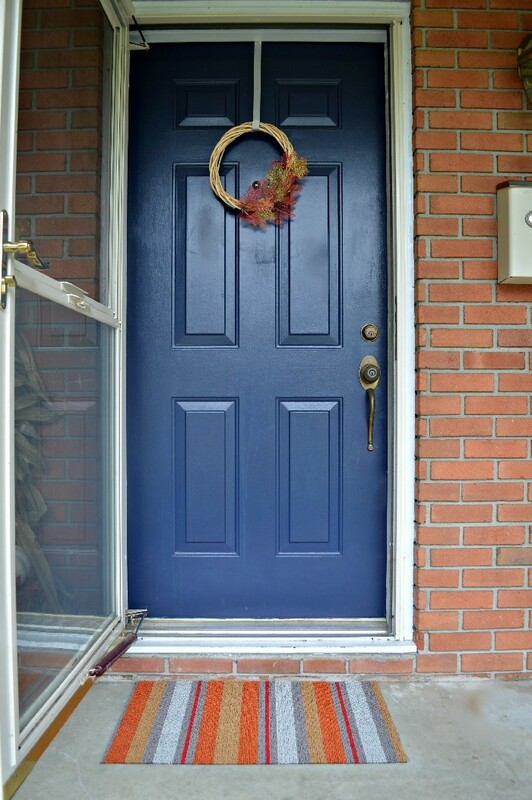 I replaced my Spray Painted Doormat with a sturdy rubber doormat in fall colors that was on clearance at our local big box store. 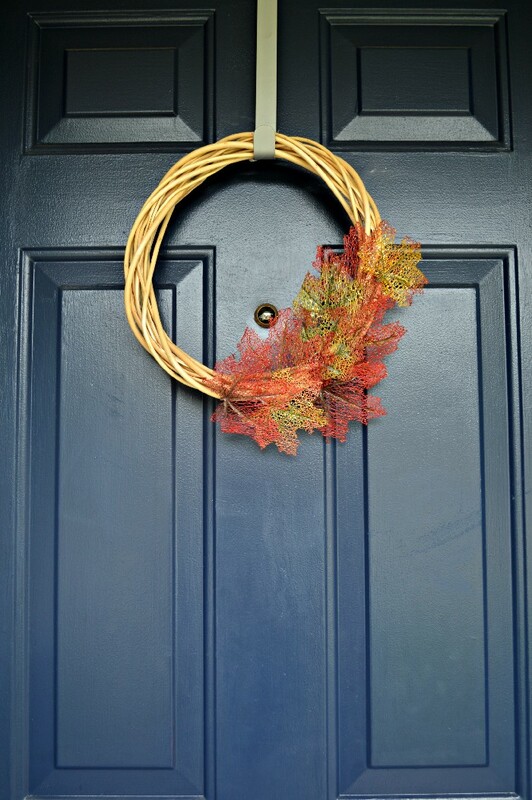 The fall wreath was super simple to make. 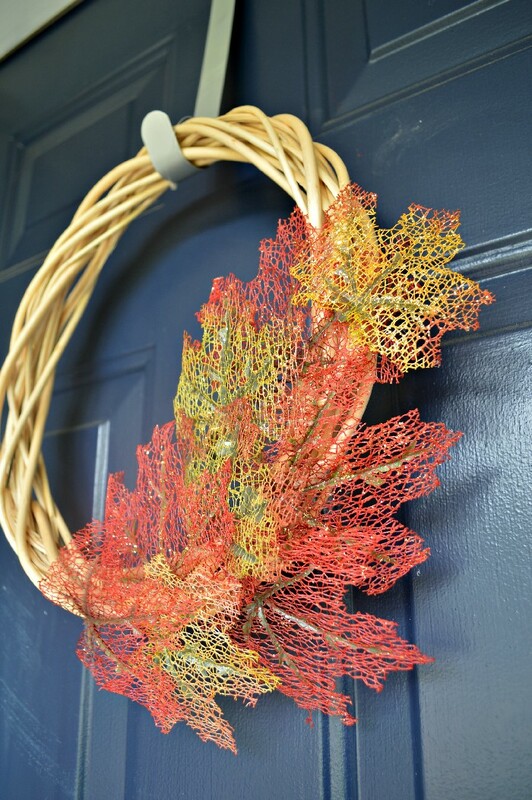 I just hot glued some dollar store leaves to a grapevine wreath, also from the dollar store. I especially liked these leaves because they reminded me of the skeleton leaf DIY everyone was trying last fall. 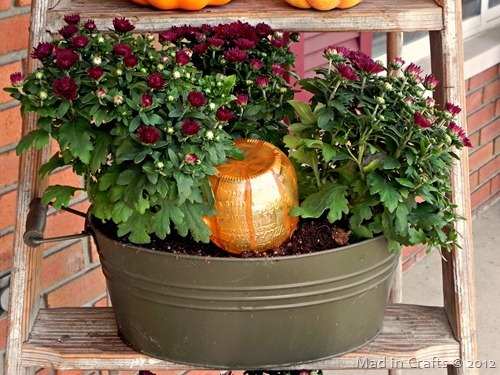 They also have a slight glitter which ties in with the glitter pumpkins in the planters. I think I did pretty well decorating the porch with items that are squirrel-proof. The bonus is that all of these items are reusable, so I can pack them away and use them again next year!